The following material has been translated from a pamphlet found in the NSDAP Hauptarchiv. 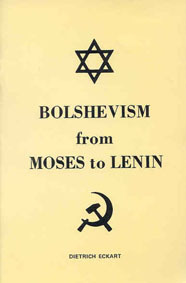 Its German title was Der Bolschewismus von Moses bis Lenin: Zwiegespräch zwischen Adolf Hitler und mir, and it was originally published in Munich in March 1924 from unfinished notes on which Dietrich Eckart had been working in the autumn of 1923. Dietrich Eckart was born on March 23, 1868, in the Bavarian town of Neumarkt, which is about twenty miles southeast of Nürnberg, and he died on December 26, 1923, in Berchtesgaden. He was a poet, a playwright, a journalist, scholar, and a philosopher, as well as a dedicated fighter for the National Socialist cause. Among his better-known works are his play Lorenzaccio and his translation and adaptation to the German stage of Ibsen's Peer Gynt. He was for a while editor of the Völkischer Beobachter, and he wrote the NSDAP song, with the famous words "Deutschland erwache," which later became a NSDAP byword.